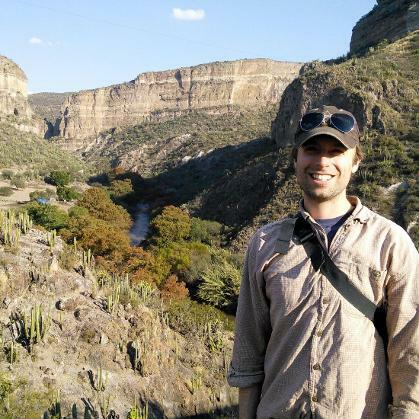 As a plant evolutionary ecologist interested in whole genome duplication (polyploidy), my research primarily focuses on questions surrounding the interplay between ecology, polyploidy, and speciation. Polyploidy is common in flowering plants, but the ecological consequences of polyploidy, and its influence on patterns of diversification remain unclear. Employing a wide range of tools, including ecological field studies, population genetics, molecular systematics, and greenhouse experiments, I seek to answer questions such as: How does whole genome duplication—polyploidy—shape evolution? Does polyploidy shape patterns of biodiversity? Are plants differing in chromosome complement adapted to different habitats? Scroll down to read more about my current research. The North American creosote bush, Larrea tridentata (Zygophyllaceae), is an ecologically important and ubiquitous shrub occurring throughout some of the most arid environments in the southwestern United States and northern Mexico. The species comprises diploids, autotetraploids, and autohexaploids with distributions that roughly correspond to the Chihuahuan, Sonoran, and Mojave Deserts, respectively. Distributions of the three cytotypes of Larrea tridentata. 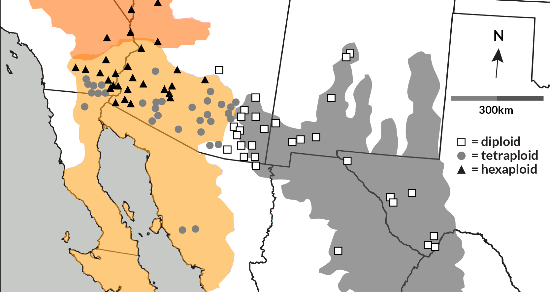 Diploids (squares) are found in the Chihuahuan Desert (gray), tetraploids (circles) are found in the Sonoran Desert (orange), hexaploids (triangles) are found in both the Mojave (red) and Sonoran Deserts. At the boundaries between the deserts, we have discovered that the cytotypes of Larrea tridentata co-occur in narrow areas of sympatry representing natural common gardens. In these natural common gardens, we have determined the ploidy of many permanently marked plants and continue long-term studies of ecological adaptation, plant-pollinator interactions, and patterns of inter-cytotype gene flow. Research over the last few decades has revealed that plant species comprising populations differing in ploidy may represent cryptic biodiversity. However, uncertainty persists over the ecological consequences of whole genome duplication—polyploidy—and whether plants differing in chromosome complement interact with their surroundings in unique ways. One way we are investigating the biodiversity consequences of polyploidy is by characterizing reproductive compatibility between different ploidies in natural common gardens and in the greenhouse where we have established plants representing all three cytotypes of L. tridentata. Temporary greenhouse on the Rhodes College campus. Working inside the greenhouse at Rhodes College. Collecting specimens at the boundary between the Chihuahuan and Sonoran Deserts. The warm deserts of the southwestern US and northern Mexico are a global biodiversity hotspot for solitary bees, over a hundred of which visit L. tridentata. Many other arthropod herbivores consume L. tridentata, or utilize the plant in some way. In past analyses, we determined that diploid, tetraploid, and hexaploid L. tridentata slightly differ in leaf and flower size, the timing of flowering, and overall appearance. We are now conducting multifaceted field investigations into whether such phenotypic differences influence pollinator visitation and herbivore attacks. Recent findings suggest that native bees of southern Arizona exhibit foraging biases among co-occurring diploid and tetraploid L. tridentata. Interestingly, bee pollinators of co-occurring tetraploids and hexaploids do not seem to have strong biases for either of these cytotypes. Polyploid plant-insect interactions are not limited to bees. Collaborative research conducted with Tim O’Connor at UC-Berkeley has documented that galling midges that specialize on L. tridentata also exhibit strong ploidy-specific interactions with some species only galling diploids or tetraploids in areas where the cytotypes come into contact. We are now expanding our investigations to other arthropod species to investigate whether polyploidy in L. tridentata may have driven patterns of co-diversification with arthropods. Specimen of Larrea divaricata, the South American sister species to Larrea tridentata. Many species in North and South America are closely related despite having disjunct distributions. For many species that occur on either side of the tropics, these non-continuous distributions are thought to have arisen as the consequence of bird-mediated long-distance dispersal events over the last several million years. The closest relatives to L. tridentata all occur in arid regions of Argentina, Chile, and Bolivia. The timing of dispersal from South America to North America, and the potential ancestral origin of the common ancestor between L. tridentata and its sister species, remains unclear. We are investigating these questions using genomic approaches to obtaining DNA sequence information from herbarium specimens, as well as new field collections of the South American species of Larrea. photos by R. Laport, G. Larsen, & J. Ng.